This is the decade that did it: The city saw unparalleled growth in its economy, its self-image, its reputation, political climate and collective mood. And that change is owed in no small part to two events that began to unfold almost exactly 10 years ago: the redevelopment of River Park Square in 1999 and a transformation at City Hall that began around the turn of the century. The former is widely credited with having jolted to life Spokane’s moribund downtown. Without RPS, Walt Worthy says he may never have rehabilitated the Davenport Hotel — which has in eight years become a tourist magnet and the nominal hub of an entire nightlife/arts district. The growth of that nightlife scene has not only brought even more dollars to downtown but has begun — if only in the latter part of this decade — to foster some pride in Spokane. Of course, the mall’s construction also provoked city-wide controversy and turned City Council meetings into bitterly divided shouting matches. But as the decade unfolded, council meetings have become more civil, the RPS scandal is nearly forgotten (except by a few tenacious outsider critics). The city has begun to look forward. Spokane’s “strong mayor” form of government, begun in 2001, has been a shaky experiment, to be sure. But each successive strong mayor has sought to improve the city’s reputation in a way perhaps no city manager ever could, and to make the city more user-friendly. In the meantime, campaigns for city positions have grown enormous and candidates less old, male and conservative than (perhaps) ever before. It’s been a damn good decade. Here are just some of the reasons why. Andy Dinnison is tearing into a submarine sandwich wrapped in crinkly paper. We’re sitting in Atticus, the café he opened next door to Boo Radley’s, the celebrated novelty gift shop at Howard and Spokane Falls that he’s owned for 16 years. He hasn’t even finished decorating Atticus yet, but he’s psyched about Jimmy John’s, the new chain sub store that opened on nearby Wall Street. 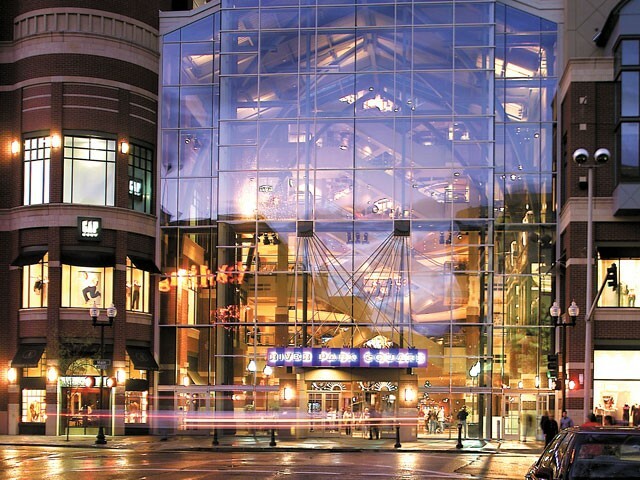 Whether or not you like its upscale boutiques and chain stores — or the controversial public-private partnership that built its garage — River Park Square is generally thought to have saved downtown when it was reincarnated in 1999. Before that, two of the mall’s anchors sat vacant, and the city’s core was perceived as barren and dangerous — an impression not helped much by Spokane Transit Authority’s new plaza. “It was pretty gray,” says Chris O’Harra, owner of Auntie’s Bookstore. The same year that the mall re-opened, the DSP developed a downtown master plan, with a lengthy checklist of projects for the area. Then Ron Wells redeveloped the city’s old steam plant. Two years later, the new Northwest Museum of Arts & Culture was finished in Browne’s Addition. Suddenly, it seemed that downtown was open for business again. The latter has been a magnet for tourism, which took off in this decade. According to numbers from the federal Department of Commerce, the amount visitors spent in Spokane County increased by 54 percent between 2000 and 2008 — when tourism brought in $833 million. The following dominos? The expansion of the Convention Center in 2007. The re-opening of the Fox Theater the same year. The growth of the University District on downtown’s eastern edge. Add on the arrival of the Big Easy Concert House (later the Knitting Factory). The condo construction boom around 2006, which Nunberg estimates added over 500 residential units to downtown. The slow but steady growth of the east-end neighborhood centering around the Community and Saranac buildings and — coming in January — the new Main Market. Not all of this can be traced directly to the mall’s opening, of course, but Nunberg calculates that the economic impact of that 1999-2000 development explosion has added up to $3.7 billion. Even as difficult economic times slow this momentum, there’s a growing sense — on the street, in bars, at clubs — that Spokane has somehow become kind of, well… cool. Of course, it ain’t over yet. Chris O’Harra at Auntie’s says she still wants to see more small, independent retailers downtown. Dan Spalding says the catalyst for the development of his east-end neighborhood was putting in apartments and condos, and he believes building more homes downtown will be the key to building more business. Groups like the DSP and GSI, looking back at all the growth downtown over the last 10 years, now see a need to connect it all, to tie together with a streetcar or a shuttle system everything from the growing U District to the east end to the hospitals to the mall to the future Kendall Yards. “We gotta reach a consensus on how that would happen,” Hadley says. Something biblical was supposed to happen in the last 10 years, says Steve Eugster, speaking like the Moses of Spokane. He’s referring to the strong-mayor form of government, which the voters approved in November 1999, taking the place of the council-manager system of the previous 40 years. Where before a hired expert ran the day-to-day functions of the city, now a “strong” mayor performs those duties, and has a relationship with the City Council similar to the one between the executive and legislative branches of the federal government. A majority of the country’s largest cities have this form of government, including New York, Los Angeles, Chicago, Houston, San Francisco and Seattle. By transferring power to an executive mayor, Spokane joined this club of 21st century cities. But locally, the results of such a governmental upgrade are anything but universally celebrated. In this past decade, Spokane has elected three mayors: John Powers, Jim West and Mary Verner. The fourth, Dennis Hession, was elevated from his position as council president after West was recalled amid allegations of using his office improperly. Hession, who lost his bid to stay in office to Verner in 2007, says the system has worked, even if it hasn’t continually produced great mayors. “The strong mayor from of government puts the mayor in a position where you are more likely to be successful,” he says. “You’re in a position where all the responsibility lies on you, so you make a better decision." As the epicenter of the Inland Northwest, Hession says, Spokane is at “such an important point in its history” and its mayors hold “the most important elected position” in the region. Both Eugster and Hession agree that Jim West best exhibited the qualities needed to lead Spokane, but it’s the West scandal that has left a bad taste in many mouths. “Jim did an effective job of leading a city, but he had so much baggage,” Eugster says, referring to accusations that West used his office to attract potential lovers. West died within a year of his recall. For Rob Higgins, who served on the City Council in the 1980s and then again as council president after the change in government, West was successful because he had 20 years of experience on the council and in the state Legislature. “You gotta be a leader and speak out on the issues,” Higgins says. “At the same time, you gotta be empathetic and humble and realize you’re there to serve the people. Jim was big on servant leadership. You don’t wanna come in and say, ‘It’s all about me.’” Which is something John Powers says he understood. “The buck stopped on the mayor’s desk … with much more accountability to the electorate,” Powers says. “I was the man in the middle,” Powers says. He was also the strong mayor first rejected by voters, voters who at the same time re-affirmed their belief in the new system by turning down an initiative that would have dismantled the fledgling form of government. • Though it entered the decade with an ugly reputation for doing too little with too much public money, the Spokane Transit Authority was able to win public support in the 2000s and dramatically beef up service. In 2004, voters finally got behind the transit agency by approving a sizeable funding increase, which they later made permanent. Ridership increased by 45 percent between 2006 and 2008, and rider satisfaction has jumped to 91 percent since the early 2000s. Plans include renovating the bus plaza and using GPS to track departures and arrivals. • Marla Nunberg of DSP says that in 2000, all that existed of what’s now known as the University District was the business incubator SIRTI. In 10 years, she says, $834 million has been pumped into the area, which now houses facilities for Washington State University, Eastern Washington University, the University of Washington and Whitworth University. • The 2000s have been the Mark Few Years. The coach arrived at Gonzaga University before the 1999 season and has put Spokane on the college sports map, leading the Bulldogs to the NCAA tournament every year he’s been at the helm.